The emergence of Internet and Web in the last decade caused a profound impact on the education sector. Today, it’s common to see teachers using smart boards to educate students in interactive and engaging ways and children making use of the online resources of Web and schools to ease learning and grasp the subject matters. 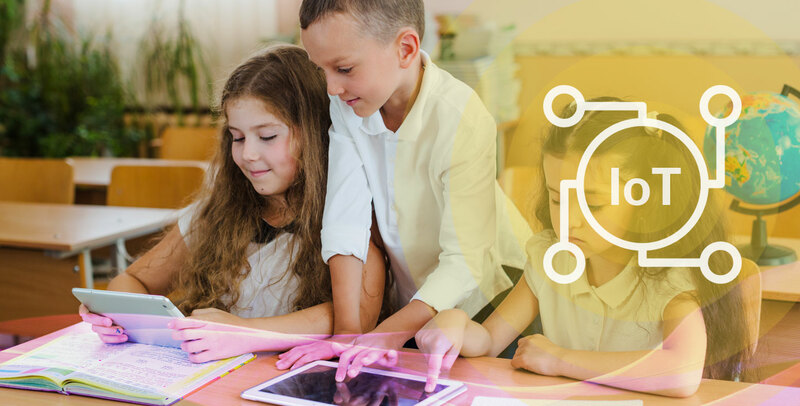 Connecting sensor-embedded boards, highlighters, and tablets with the Internet, education institutions are stepping into the smart education system to facilitate better collaboration among teachers and students irrespective of their physical locations. Thus, entire world turns into a classroom leading to real-time knowledge sharing and problem-solving. Complex principles or theorems of physicals, biology, and other subjects can be vividly described to students with the use of interactive high-resolution images or videos. This eases the teacher's efforts and enables students to develop a better clarity on the matter. Quick Response (QR) codes have made their way into the school textbooks. Thus, students can easily decode the feedback, assignments and additional knowledge resources by scanning the QR codes with their smartphones. Thanks to RFID (Radio-frequency identification) chips, today students can gauge values of gravity, the wavelength of light, viscosity and other metrics about their experiments with much higher precision in their labs than it used to be earlier when the calculation was done manually. However, those chips must be well-integrated with the physical objects and the virtual Internet of Things application. A healthy competition among students and groups is imperative to enhance the level of learning and nurture the innovative thinking in students. Leveraging Internet of Things application, it becomes easier to create a collaborative learning environment where students not just stay connected, but inspired and motivated to progress ahead. Using RFID tag or scanning QR code students can send and receive data on a project to/from their peers. Connecting all amenities of campus with an Internet of Things platform, institutions can build a safer environment. Any sensor-embedded entity is it school bus, entry or exit gate, labs, classroom, washroom, or their windows and doors, etc. can have an embedded sensor that can collect and receive information and respond to the user’s command. Thus, any unpleasant situations like theft, vandalizing attempt can be tracked and located on a real-time basis. Some manual tasks like taking attendance, reporting on the availability of equipment in labs and inventory, and taking stock of sports equipment available on the playground are time-to consume. Such repeated processes can be automated with the help of Internet of Things. The automation and monitoring through IoT fee up vital resources required for the task. Key benefits of an IoT enabled school management are as follows: reduced labor and labor cost reduced errors, improved management, and ultimately better deliverables - education. With the availability of subscription-based robust IoT development platforms, lowering of prices of RFID tags, GPS sensors, etc., availability of experienced IoT consultants and developers in the marketplace, government’s focus on taking education at par with the global standards, it’s no-brainer to assume that education sector will embrace IoT wholeheartedly to stay competent disseminating quality education. According to the International Data Corporation (IDC), the market for IoT solutions worldwide is expected to reach USD 7.1 trillion by 2020, and a significant contribution is likely to come from the education sector. NEXT POST Why Google, Microsoft, IBM & Tech Companies are Investing in Chatbot?